Don’t worry. The Atomic Buddhist Statue that stands outside of the New York Buddhist Church in New York City isn’t radioactive. And it isn’t some example of 1950’s kitschy art, either. 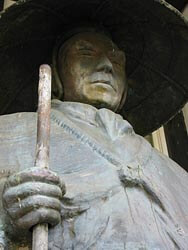 The statue, also known as the Shinran Statue, actually has a much longer, more somber history. The 15-foot bronze statue’s story begins in Japan, in the city of Hiroshima where the statue was erected to honor Shinran Shonin, the founder of Shin Buddhism. During the Japanese war effort during WWII, many such bronze statues were melted down and the metal used for weaponry or military vehicles, yet the Shinran statue survived such a fate. As the war in the Pacific arena came to a head, the Shinran statue was once again poised for destruction. At 8:15 in the morning on August 6, 1945, American forces dropped the atomic bomb on the city of Hiroshima, killing over 150,000 men, women, and children, and laying waste to over 90% of the buildings and other city structures. The Shinran statue, at only 1.5 miles from the center of the detonation should have certainly been destroyed, but its survival served as a symbol of hope for all those who witnessed it standing amid the devastation. A Japanese industrialist gave the statue to the New York Buddhist Church where it was unveiled in 1955 as a symbol of world peace. Today the statue still stands in front of the church, and serves as a testament for many of the strength of pacifism amid the turmoil and destruction of war. Last updated by Anne Michelle Ricker on 13 February, 2011 in Destinations.